✅ Trip Verified | For my flights with Avianca, I had the front row seat in economy on the A330. Row 7 has a missing window, but this isn’t too bad as you have one window for view, not a blank wall. The seat is quite old, but seems to be in good condition. 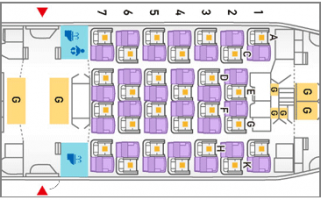 To truly prove that an economy class seat is good, you need to fly it on an overnight flight. That is when you can truly say if it’s good or not. Unfortunately all my flights were day flights. The headrest was a first for me, never had a side ballast that folded down, rather than folded in! I don’t see any benefit to this and the headrest functioned as a good cushion. There is a handy storage compartment on the back of the seat in front, and the screen is a reasonable size. Entertainment is plentiful and the screen is slightly unresponsive. The problem I really had was the fact that they did not have enough pillows and blankets for everyone. It seemed that they placed them on random seats, although I suspect the passenger manifest would’ve been consulted for gold members, as I was given one at my seat. The legroom was pretty large and it had a large footrest. The only gripe I would have with the seat would be the headrest.